Awesome hiking partner with agility dog potential. 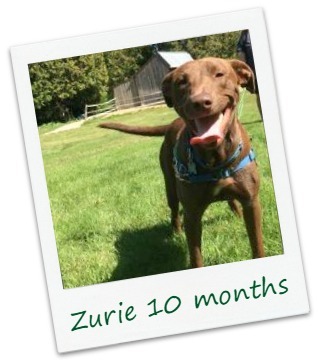 Zurie is a 9 month old Chocolate Lab likely mixed with Vizsla or Weimaraner. She is playful, likes interacting with people and other dogs. Zurie has a happy-go-lucky personality and an adorably goofy tongue that hangs out sideways when she smiles. Housebroken and crate trained, her ideal home will include another playful dog. If other dogs are not in the home, Zurie would be happy as long as she had regular social outings where she could play with other dogs such as visits to doggy daycare, dog adventure camp hikes, dog parks. She enjoys riding in the car, playing, swimming and just hanging out with her person. She's an all around great dog. "Zurie is a really sweet girl. She is not actually high energy all the time as I thought she might be. She plays hard with my dog, Bigzy, and is learning to take cues when Bigzy has had enough." "Zurie is a very playful, curious, sweet puppy and is settling in nicely. Mostly she just wants to be near people and settles herself nearby where ever we go. She is also pretty good at playing by herself with the various dog toys lying around. " "She's a great dog. We even gave her a bath and she was so cooperative. She is a love." Zurie is already spayed, up-to-date on vaccines, and is heartworm negative! - Great jogging partner with agility dog potential! Our adoption fee is $350 which includes age appropriate vaccines such as (Distemper, Bordetella, Parvo, Rabies), spay/neuter, worming, microchipping, and health exam. Discount vouchers for training, grooming and similar dog related products and services are provided.